Attention: Some quakes are audible but not visible on the map. ‘Gas extraction could cause quakes’ (Shell-Exxon = ‘NAM’). ‘Quakes up to M3 possible’ (MIT). As early as 1991 houses started to collapse (discovered by Dutch radio program Argos, 2013). Earthquake at Roswinkel, M 3.4 / 3 km depth, very shallow. Shell + ExxonMobil = NAM (‘Nederlandse Aardolie Maatschappij’). ‘Quakes probably caused by gas extraction’ (KNMI, Royal Netherlands Meteorological Institute). Earthquake at Alkmaar, M 3.5. Earthquake M 3.5 / 3 km, triangle Middelstum, Stedum, Westeremden. ‘Last year, the amount of gas sold abroad reached a record high.’ (NOS, Dutch public broadcaster). Houses in Groningen damaged as a result of earthquake. Again, Groningen is hit by a severe quake (Huizinge, M 3.6 / 3 km depth, very shallow). Quake North of Groningen, M 2.8, 3 km depth, very shallow. In 2013, ExxonMobil and Shell extracted twice the amount of gas from the ground than they agreed they would. First earthquake close to the city of Groningen (200,000 inhabitants). At least 1350 monu­ments are dama­ged. 100.000 house owners report damage. “Gro­nin­ger Bo­dem Be­we­ging” (GBB) vi­sits UN Hu­man Rights Coun­cil in Ge­n­eva. 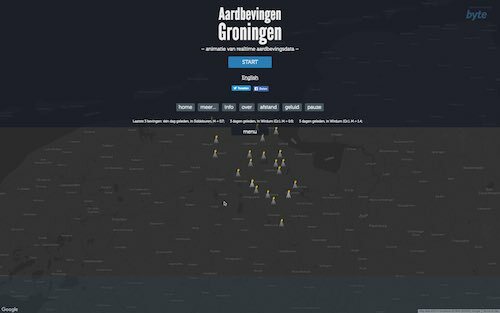 Again, Groningen is hit by a severe quake (Zeerijp, M 3.4 / 3 km depth, very shallow).